The 2019 off-road new model bike season is in full swing, and Yamaha is the latest manufacturer to announce its full lineup of motocross and cross-country motorcycles. Over the past couple of seasons, Yamaha has made big steps in expanding its model range with the introduction of the FX models in both 250 and 450cc configurations. Additionally, it’s the only Japanese manufacturer to continue producing full-size two-strokes, including the YZ125and YZ250 motocrossers, as well as the recently introduced cross-country oriented YZ250X. The bLUcRU hasn’t forgotten about the little guys either. The all-new YZ65 was announced just a couple months ago, and the YZ85 has received extensive upgrades for 2019, too. 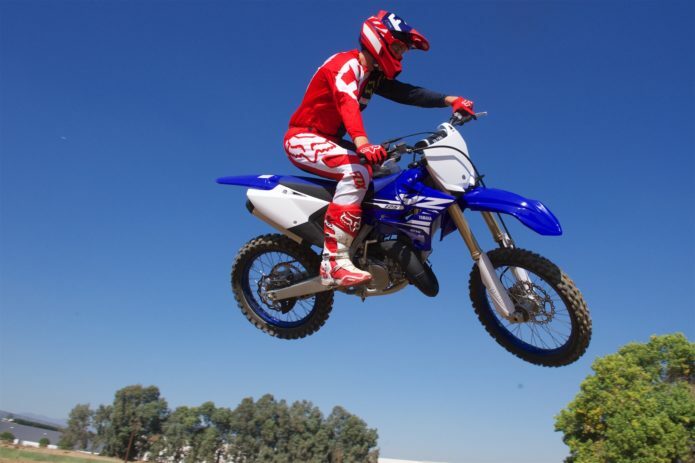 But this season, it’s the YZ250F that’s received the most love. Last year, the 2018 YZ450F got a major overhaul, and it was only a matter of time before those upgrades trickled down to its 250cc little brother. For 2019, the YZ250F gets an all-new engine, with updated cam profiles, piston, cylinder geometry, throttle body, a larger diameter clutch and electric start. The chassis is redesigned too, with modifications to the frame and bodywork to improve handling and make the overall feel of the bike slimmer and more nimble to move around on. Additionally, the entire model range received upgrades and updates to its KYB suspension components, with larger fork cartridges and damping rods. And possibly 2019’s crowning jewel, most four-stroke models now feature a wireless smartphone based engine tuner – scroll down to find out more. What’s missing, unfortunately, is a street-legal YZ450F-inspired dual-sport. After Honda’s recent announcement of its CRF450L, we’re hoping a blue version comes along soon..
Utilizing a compact starter motor and ultra-lightweight lithium-ion battery, the 2019 YZ250Fbrings the convenience of push-button starting to the racetrack for quick and effortless restarts under pressure, and relaxed riding when the clock isn’t ticking. Powered by a high-capacity and ultra-lightweight lithium-ion battery, the system adds minimal weight. For 2019, Yamaha has refined its distinct rearward-slanted cylinder design for the YZ250Fengine. The liquid-cooled, DOHC 4-valve, fuel-injected engine features a forward-positioned straight downdraft intake with symmetrical intake and exhaust ports. Fuel is delivered by a lighter 44mm throttle body, through a new 12-hole Denso® injector. A new, higher-compression flat-top forged piston features a bridge-box design for additional strength with minimal weight. The piston, rings and DLC-coated piston pin, along with the offset cylinder configuration, all reduce friction loss and contribute to quick response. Available in either Team Yamaha Blue or White color schemes, complete with the onboard Communication Control Unit (CCU) and the Yamaha Smartphone Power Tuner App, the all-new 2019 YZ250F will arrive at Yamaha dealers beginning in June 2018 with a MSRP of $8,199. Cypress, CA – June 6, 2018 –Yamaha Motor Corporation, USA, today announced their exciting 2-stroke motocross models for 2019. Highlighted by the new YZ85, the 2-stroke lineup includes the return of the iconic YZ125 and YZ250. The all-new 2019 YZ85 will be available in Team Yamaha Blue and will arrive at Yamaha dealers starting in June 2018, with a MSRP of $4,599. The legendary YZ125 and YZ250 models return for 2019 to complete Yamaha’s lineup of 2-stroke motocross bikes. Lightweight aluminum frames and patented YPVS™-equipped (Yamaha Power Valve System), reed-valve inducted engines provide an incredible power-to-weight ratio while maintaining Yamaha’s excellent reliability and durability. Both the YZ125and YZ250 each receive the same industry leading KYB spring-type fork and KYB rear shock for unmatched handling on the track. The 2019 YZ125 and YZ250 will be available in Team Yamaha Blue and begin arriving at Yamaha dealerships in June with MSRP’s of $6,499 and $7,399 respectively. The 2019 YZ450FX utilizes an all-new engine design that features a new cylinder head, piston, cam shaft profiles, cylinder geometry and more – all working together to deliver classleading power and even more controllability for Cross Country racing. Its bilateral beam frame is all-new with an optimized engine mounting position to improve the machine’s rigidity balance, resulting in improved cornering ability and traction. The 2019 YZ250FX will be available at Yamaha dealerships beginning in June with a $7,999 MSRP. The 2019 YZ250X will be available at Yamaha dealerships beginning in June with a $7,499 MSRP.